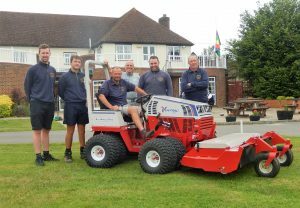 Wrotham Heath Golf Club, situated in the rolling Kent countryside near Sevenoaks, has taken delivery of a Ventrac 4500 compact tractor with two alternative mowing decks and a stump grinder attachment, from local dealer MAB Groundcare. Established in 1906, Wrowtham Heath is a members club and features an 18-hole golf course situated on a sandstone ridge which results in excellent drainage ensuring the course is playable all year round. A recently installed irrigation system on the tees, fairways and greens together with a new bore hole and holding tank ensures the best playing conditions, even in the driest weather. 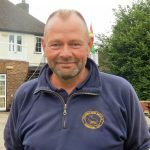 Bryan Preece is the head greenkeeper and has been at the club for the past six years, having previously worked at West Malling, Nizels and a spell in Riverside Golf Club in Tasmania. He heads a team of five greenkeepers and works closely with former Captain and current Greens Chairman, Stan Topliss. “This is one of the best pieces of equipment that I have ever purchased,” Bryn said. “Our Toro Sidewinder was getting a bit long in the tooth and I was looking for a replacement tees and bunker surrounds mower. 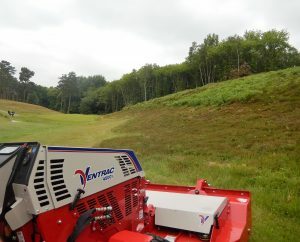 I read an article in a trade magazine where Peter Pattenden at Carden Park was extolling the merits of his recently purchased Ventrac. Peter is guy I wholeheartedly respect, so I contacted the UK distributor, Price Turfcare and arranged a demo here for the team and the Greens Chairman. 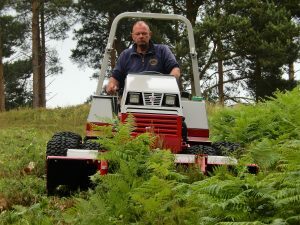 We selected the toughest area we could find, some banks covered in bracken on the 3rdfairway. and it dealt with it with ease. In fact, it was the best machinery demonstration I have ever seen.